The 70th anniversary of World War II is being commemorated around the world, but the contribution of one group of soldiers is almost universally ignored. How many now recall the role of more than one million African troops? Yet they fought in the deserts of North Africa, the jungles of Burma and over the skies of Germany. A shrinking band of veterans, many now living in poverty, bitterly resent being written out of history. For Africa, World War II began not in 1939, but in 1935. Italian Fascist troops, backed by thousands of Eritrean colonial forces, invaded Ethiopia. Emperor Haile Selassie was forced to flee to the UK, but others, known as Patriots, fought on. Among them was Jagama Kello. Fifteen years old at the time, he left home and raised a guerrilla force that struck at the Italian invaders. Read more. Emperor Haile Selassie I didn’t flee. 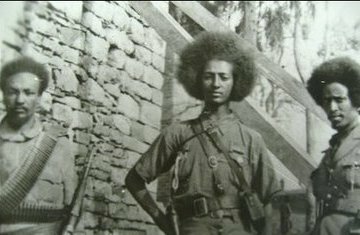 He went to the League of Nations (under the council of his advisers) to defend Ethiopia and to condemn Italy and all other nations that failed to uphold the charter of the League. During this condemnation, the Emperor accurately prophesied the end of the League of Nations. The Emperor also needed to be in Europe to convince the British of their imperative to help restore justice in Ethiopia and the World. This is finally what saved Ethiopia. I totally agree with you Ethiopian patriots regardless what the later day revolutionaries/thinkers whatever you like to call them condemning the Emperor for leaving the country . The first would be what you pointed out and the second case could be that the Italians could have stayed a lot longer if they captured him and make one of his rivals as a dummy King . Despite everything, these were brave and resourceful soilders. As an african american career soilder in the united states navy. I can appreciate this, and its no wonder why it is such a source of pride for the country of Ethiopia. Its only a shame that these soilders now live in poverty and dont get the historical accolades they deserve.